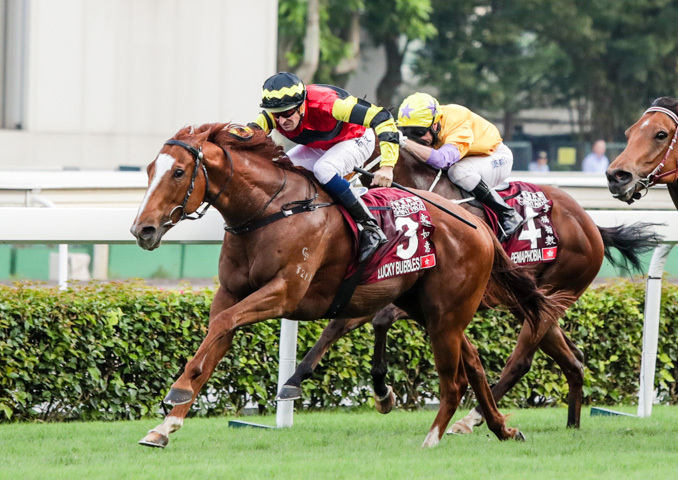 Australian jockey Hugh Bowman forced the Francis Lui trained Lucky Bubbles (AUS) through a narrow gap to win the HK$14m, Group 1 The Chairman’s Sprint Prize (1200m) at Sha Tin on Sunday in a blanket finish that had the first four home within 2L of each other. Bowman settled fourth on the rails as Peniaphobia and Neil Callan led the field into the main straight followed by Dashing Fellow and Sam Clipperton and Not Listenin’tome and Tommy Berry. At the 400m Bowman was boxed in. Peniaphobia still led at the 200m, but Dashing Fellow weakened and crucially Bowman was able to take a line to the outside but inside Not Listenin’tome and Berry. Berry drove Not Listenin’tome to the lead as Peniaphobia was the next one to fade and the move looked a winning one. Then Bowman sent Lucky Bubbles forward and they took over just short of the line. It was finely timed and successful. Mr Stunning and Joao Moreira came with a final rush out in the middle but too late. Bowman had secured yet another Group 1 in his quest to be the world’s leading Group 1 jockey and Lucky Bubbles his first Group 1 victory after running second to Chautauqua last year. 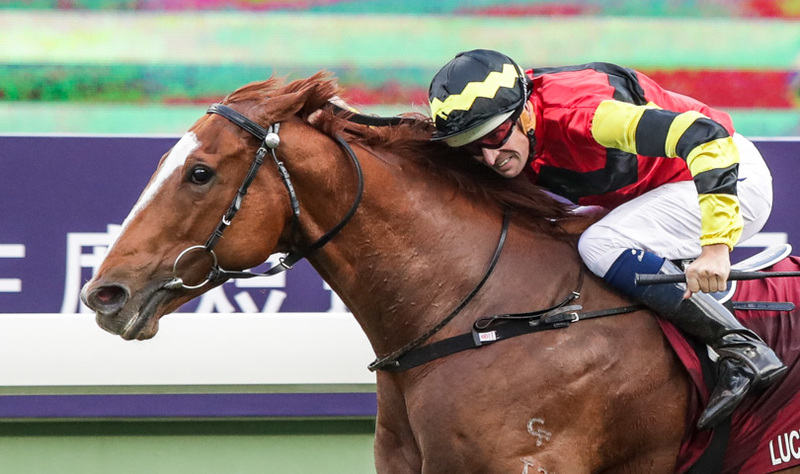 Mr Stunning (AUS) (Exceed And Excel) and Moreira were second with Not Listenin’tome (AUS) (Dylan Thomas) and Berry third with the margins a neck and a neck. The Wizardofoz was fourth and Peniaphobia fifth. The time was 1.08.96 on the Good to Firm track. Brett Prebble had been taken off Lucky Bubbles and he finished sixth on Amazing Kids, but at least he had the satisfaction of winning the previous race, the Group 1 Champions Mile (1600m) on Contentment. “It has been a tough year,” Lui said. “He has tried so hard but he has been a little bit unlucky, he struck trouble in a couple of his runs and so he should have won one or two more. “I have said all along I don’t think Brett did anything wrong, and I must thank him – he has done so much work with his horse,” Lui said. “From the good draw and with a predictable race pattern, I was able to be where I anticipated I’d be just behind the speed,” Bowman said. “The horse was able to travel comfortably within himself in that position because the pace was not frantic. Lucky Bubbles is a lightly raced five-year-old Sebring gelding out of the Hussonet mare Bubble Below. Raced just 17 times he has won seven and placed in seven for stakes of HK$27,676,050 for the Lucky Syndicate.